Michaels journey along the 30-degree east line of the longitude encompasses 17 countries and both hemispheres from Greenland in the north to Kenya, South Africa and Chile in the south. Along the way communism collapses, apartheid ends, and civil wars are sparked as Michael meets Santa Claus and Lenin, goes shopping for camels in Omdurman and makes a final hectic dash to the South Pole. The delightful Michael Palin returns in another compelling documentary series that takes the viewer on a global tour of the world from the cold gaps of Greenland to the South Pole. This documentary features an in-depth look at the various cultures of the world and truly showcases each unique culture. With over 422 minutes, this series is for the perfect documentary enthusiast. For those that are unfamiliar with Palin, I suggest you check out Monty Python for some of the strangest humour to ever hit Australia. The presentation of this series is 4:3 with Dolby Digital 2.0 stereo that actually looks quite impressive on the big screen. 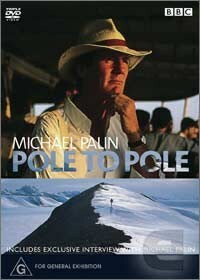 There is also a exclusive interview with Michael Palin on the disc on the making of this series.